I officially have just under 16 hours to post one more Christmas treat before the holiday has come and gone again. And what better time to sit down and write than my favorite part of Christmas day when everyone else in the house is still asleep (including our puppy Max who is still sleeping in bed with my husband – he is not a morning dog!) and the only light in the room is coming from the tree. It truly is magical. It’s always been my favorite moment to reflect on the true meaning of the holiday, remind myself of the generous amount of blessings in life even after a particularly tough year and arguably most importantly….relax. Enjoy my ‘me time’ before the hustle of the day begins and we’re tearing through gifts, taking Hailey to her Mom’s and heading north for Christmas with my family. I am very much looking forward to Hailey getting out of bed though and seeing her face light up when she notices the gifts under the tree. She’s 14 now so the magic of Santa is long gone (ho hum), but she’s still a kid who said she was going to have trouble sleeping last night because of her excitement and that warms my heart. Much like the moment it turned 6:59pm last night and we suddenly heard footsteps running up the stairs from the basement. Let me explain. We have a tradition every year where Hailey gets to open a Christmas Eve gift at 7:00pm. Her gift always contains new pajamas and slippers, a personalized gift, drinks/snacks and something to do like a new movie, game, etc. I’ve always written about it on my first blog and you can see the details of this year’s gift if you click right here. I absolutely love that she looks forward to this every year and anytime your teenager shows they’re still a kid at heart you can’t help but smile. Once she opened this year’s gift and got in her new PJs we made some hot cocoa and accessorized the mugs with these delicious cute treats! These are without a doubt the easiest and quickest treats of all my holiday recipes. If you have all of the ingredients you could certainly make candy cane marshmallows today and add them to your morning or evening hot cocoa. They may even be good with coffee. A touch of peppermint mocha? Chocolate and peppermint is my favorite sweet combo during the holidays. There’s actually a chocolate peppermint cookie recipe I’ve had pinned on Pinterest and wanted to try this season, but someone keeps messing with the clocks around the world and time got away from me! I hope there’s a search party out for that guy, because he gets faster every year. 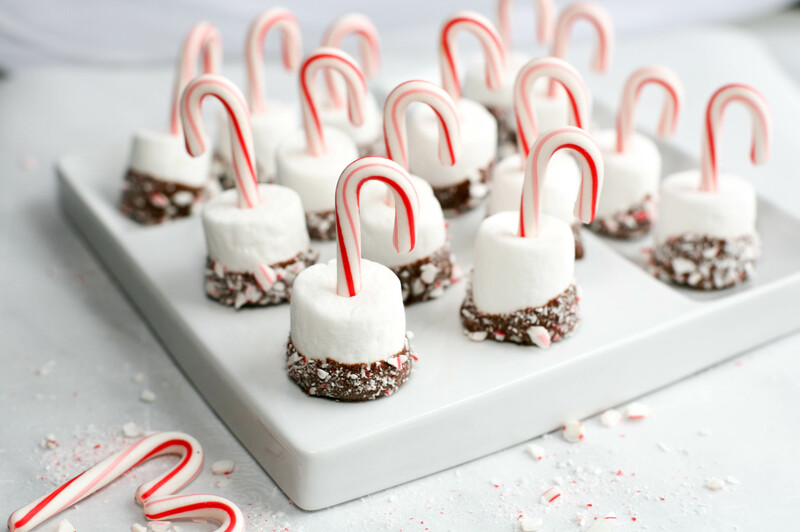 The candy cane marshmallows look super cute on a dessert table too. They definitely don’t need a mug of cocoa to be a hit at your party or family get together. I had these out at one our annual Christmas parties a couple years ago, partly for decoration and partly for eating, and everyone commented on their cuteness and how good they tasted! I don’t think I really need to talk you into them though, I’m fairly certain the photos will do that for me. 🙂 My household is starting to wake up – husband and Max are out of bed. So that’s my cue to close the laptop and start enjoying the day with family. I hope you all have the most wonderful holiday. Stick one mini candy cane into the center of a marshmallow, vertically so they can stand on their own. Make as many as you'd like, but be sure to leave extra mini candy canes. Place the remaining candy canes in a Ziploc bag and use the smooth side of a meat tenderizer to crush into small pieces. Pour into a small bowl. Pour the chocolate into a small bowl and microwave to melt. Melt in 30 second increments on 70% power level and stir between each increment. One by one, dip the candy cane marshmallow in chocolate to coat the bottom half then immediately sprinkle crushed candy cane over the chocolate. I do this with a spoon. Place marshmallows on parchment paper to set. Store in airtight container once set. Enjoy! This entry was posted in Dessert, Recipe Book and tagged candy cane marshmallows, candy canes, chocolate, christmas treat, easy christmas dessert, hot cocoa, marshmallow, peppermint. Bookmark the permalink.